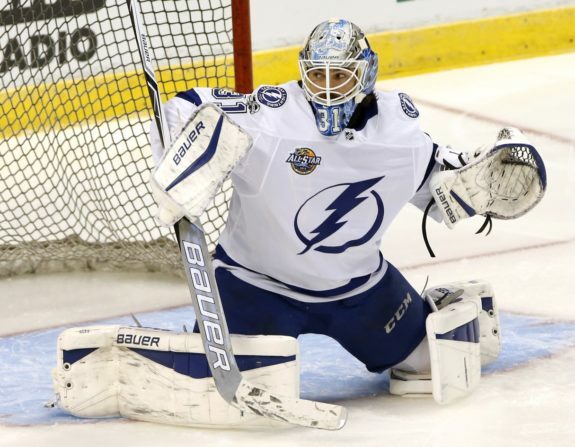 With Peter Budaj’s rather serious injury incurred against the Philadelphia Flyers, the Tampa Bay Lightning will be forced to answer a looming question about the team. While starting goaltender Andrei Vasileveskiy is one of the best goaltenders in the league this year, Budaj has been a less-than-inspiring back-up. While he has done enough to keep his place with the team, there was a growing discontent that the Lightning would need to upgrade at the position before heading into the postseason. For the Lightning, there are a few options to replace Budaj in the short-term until they know just how serious his leg injury is. If he is lost for the rest of the season, the team will need to evaluate all options at back-up before the trade deadline in March. This may mean reaching into their stockpile of resources to bring in a back-up who can help the team reach their ultimate goal of a Stanley Cup Championship. 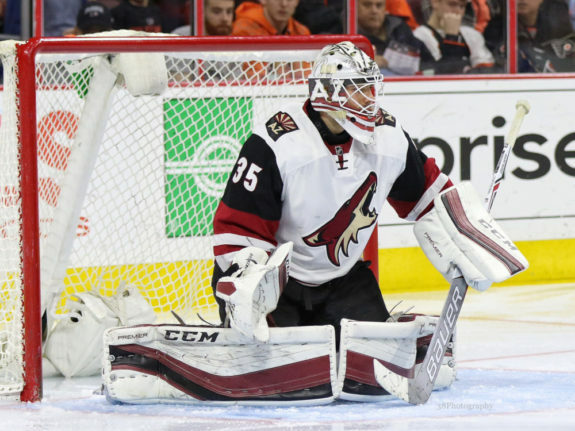 Earlier this season, the Lightning sent veteran goaltender Michael Leighton and forward Tye McGinn to Arizona for goaltender Louis Domingue. While Steve Yzerman made the trade to help stabilize a struggling Syracuse Crunch team, this move also brought a potential backup candidate into the organization in Domingue. Since taking over in Syracuse, Domingue has been solid, posting nine wins in 13 games while helping the Crunch to a 10-game winning streak. With Budaj hurt, Domingue is a perfect candidate to fill in behind Vasilevskiy. Despite being shaky during his time with a struggling Arizona team, Domingue has logged almost 80 NHL games since the 2014-15 season. He has the experience to be a competent backup for a strong Lightning team, but he also won’t need to compete with Vasilevskiy for starter duties. Since Domingue knows exactly what his role is with the Lightning, he can solely prepare for life as a backup. If he succeeds, he could find his career rejuvenated and the Lightning could have their backup concerns solved without giving up any future assets. If Domingue struggles with the Lightning, Yzerman will need to look around the league for a short-term solution for playoff season. Goaltenders are likely to be in high demand this year as multiple teams need replacements for their injured starters. While the Lightning won’t need a starter, a backup is likely to net a significant return for a selling team. Even though a short-term trade would be uncharacteristic for Yzerman, he may have to part with a few assets to give Vasilevskiy some insurance in net. Given the Lightning’s lofty expectations this year, it would be foolish to approach the playoffs without any plan B should something unexpected happen to their starter. One of the biggest fish in the goaltending pond this year is Petr Mrazek. With the Detroit Red Wings seemingly in the middle of a rebuild and Mrazek’s current contract set to expire at the end of the 2017-18 season, it seems likely that the goaltender could be traded this year. The Lightning have a long history playing against Mrazek, who almost knocked them out of the 2014-15 playoffs while replacing Jimmy Howard in net. 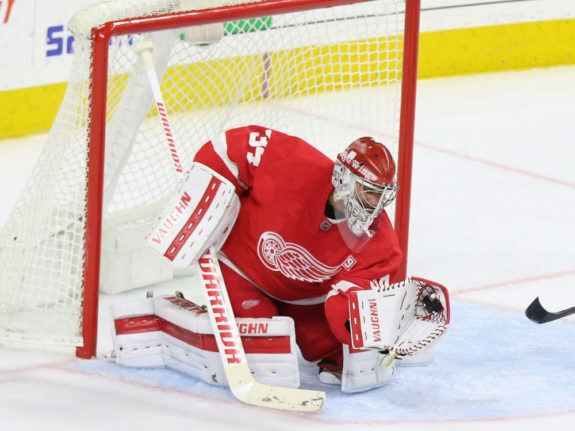 Although Mrazek has shown flashes of brilliance during the playoffs, he has struggled this season, losing his starting job with the Red Wings. If the Lightning are willing to spend, they could get an experienced short-term backup to make a run at a cup. Besides Mrazek, the Lightning could consider a handful of experienced AHL goalies who have struggled to recapture their place in the NHL. For example, Andrew Hammond had brief but significant success with the Ottawa Senators before sliding back down their depth charts. Hammond could make a decent backup option if the Lightning are willing to gamble for someone cheaper who has break-out potential. On the other hand, Michael Hutchinson would cost the Lightning a good bit to pry away from the Winnipeg Jets, but he represents a player who is playing at a high level in the AHL right now. While the cost would be high, this would feel like a much sounder resource investment if Yzerman is going to make a trade. For the Lightning, though, the best case scenario is for Domingue to come in and take over the backup spot. All he needs to do is give the Lightning the opportunity to win each game he starts, even if he plays a bit sloppy at times. Life as a backup goaltender is difficult, so even if his statistics are unimpressive, he just needs to do enough to get points. Right now, the Lightning are hoping that their seemingly small midseason trade will have a big payoff for the team.